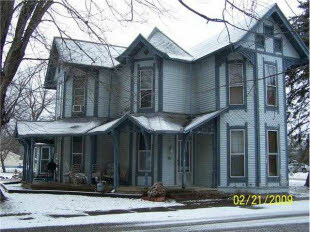 Victorian style home awaiting for you to bring it back to life or remove it and build new. Nice corner lot with older 30x32 pole barn. Convenient location yet off the beaten path. Interior boast of pocket doors, beautiful staircase spacious rooms. An archived photo from 2009, before it was boarded. Great house. I would buy it just for that kitchen window! The town is VERY small. But Shelbyville is close by (pop. 20,000), and Indianapolis is 45 minutes away. …and to think that I saw it on Mulberry Street! The antithesis of a ranch house; it seems to take upward-reaching angularity to Gothic heights. That first photo is Expressionistically arty! Some nice intact details. 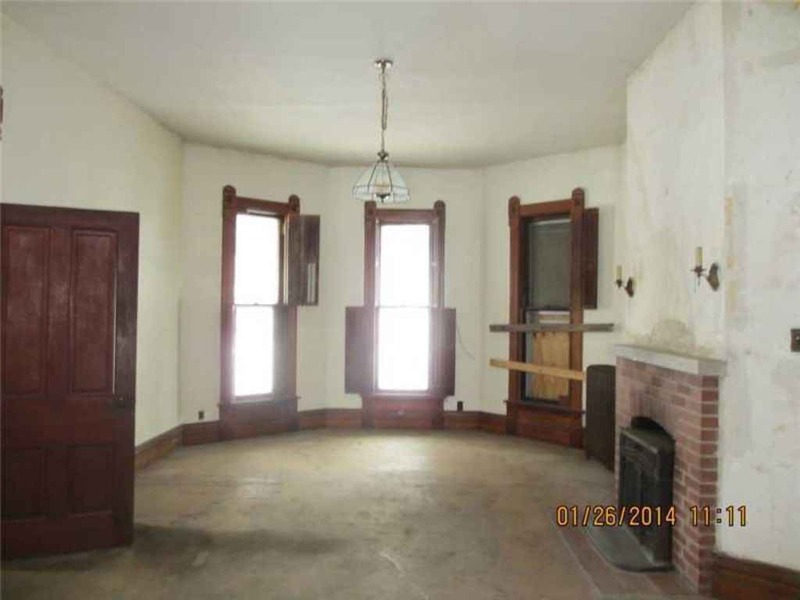 The listing says it has a basement, but it appears to sit almost right on the ground. Surprisingly intact interior…I never would’ve guessed based on the exterior condition. 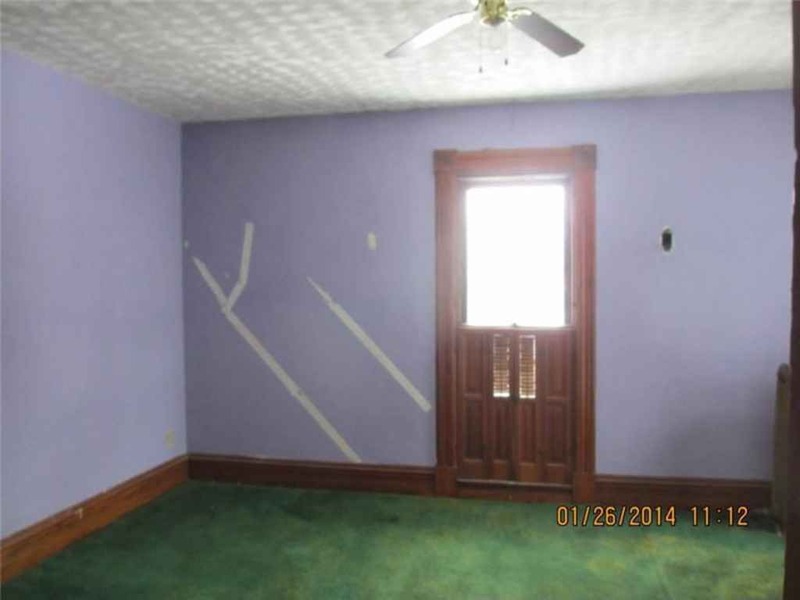 I mean, there is some obvious work needed here, but overall this house isn’t as bad off as some of the other fixer uppers I’ve seen. It really drives me nuts though when the realtor makes a point to capitalize on a beautiful staircase and the not include a picture if it in the listing. I was kind of looking forward to seeing it being that it probably isn’t slathered in white paint. I love the woodwork in this one! 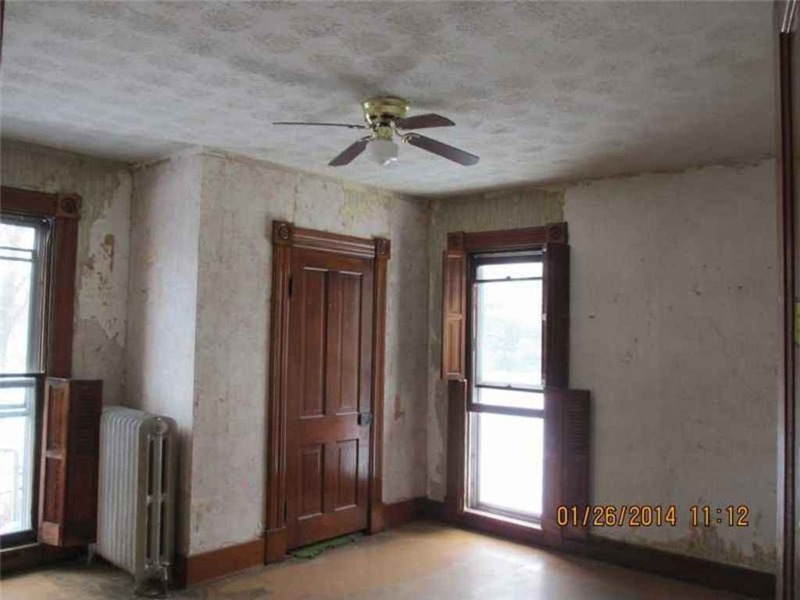 Excellent “good bones” type property. 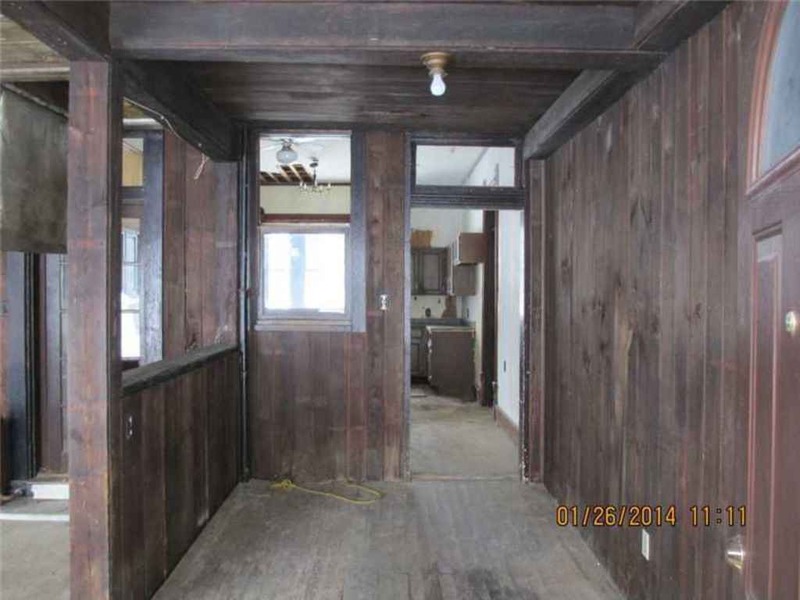 While substantial work needed is obvious, it’s priced low enough the buyers could move an RV next to the house to live in while beginning rehab or could find a trailer/mobile Home to live in for a few months. Foundation and roof would be priorities, then cosmetic work. Might need all new systems but maybe something would be salvageable. Big project for someone with energy and vision but after restoration could be very nice. Rough? Yes, but for less than a decent used car price. I’d like to see someone save this one. I was wondering if the fireplace is original. I doubt it but maybe I am wrong? I was interested in the house because I had some friends a few hours away that could help me restore this. Sad thing though when I talked to the realtor she conveyed there was a lot of interest. Not interest in the house but the land and a building. Afraid I could not do a bidding war scenario but I cringe at the fact that it has a distinct possibility of being torn down. Just thought I had to share this because I need therapy after hearing about this news. Hi Shelly, well, yes, a realtor would say that there was a lot of interest. But that is a very different thing than an offer. If you want the house, make an offer! I spoke to a realtor once that was all gloom-and-doom about a house, saying there was a lot of interesting but it sat on the market for years. 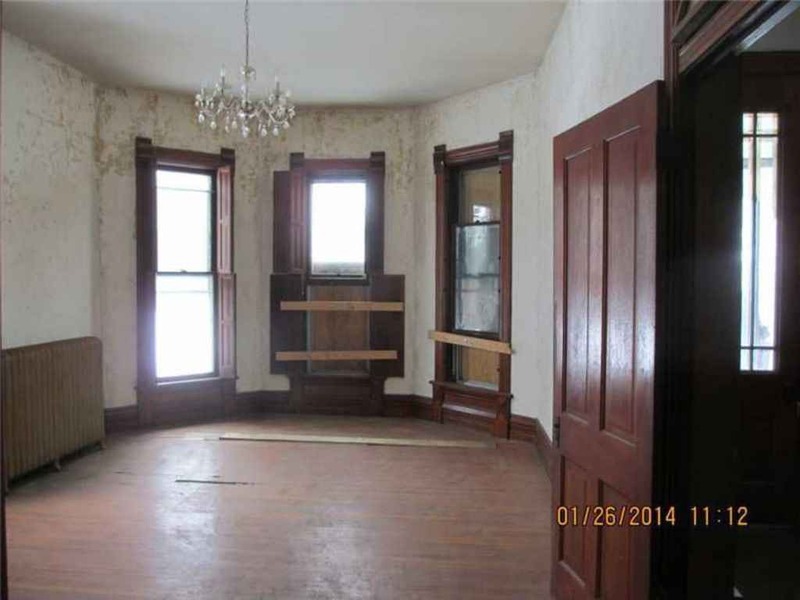 If it’s a house that you could possibly restore, go for it! Or else you’ll think about it for weeks/months/years after, always wondering “what if”. 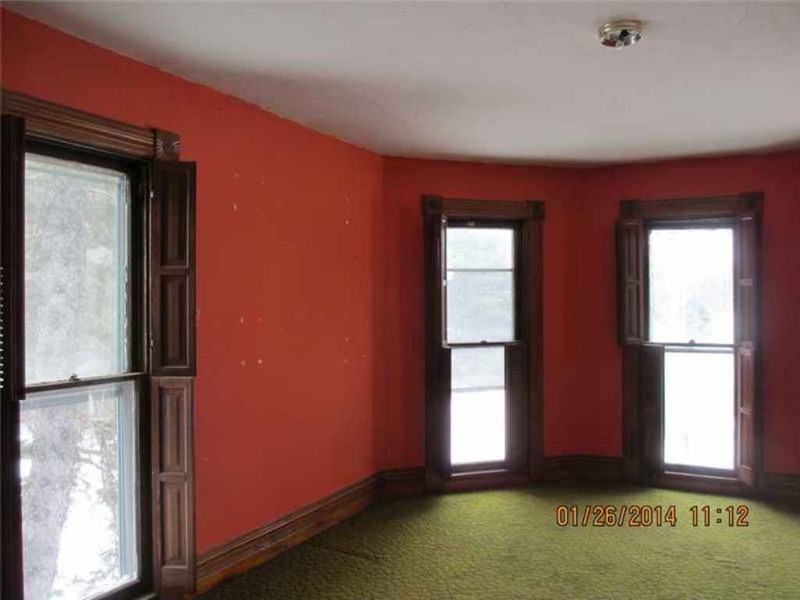 Realtors are paid to be upbeat and portray their listing as a choice jewel even when its like this one. I have no doubt the location within the community may be such that the land would have more value to someone than the land with the house. But again, until there’s a “pending” or “sold” on the property, its fair game. 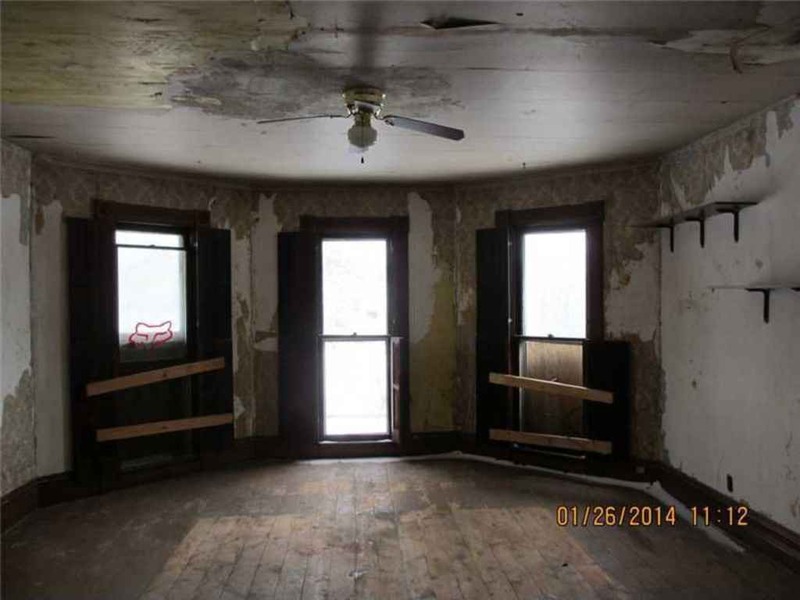 I expect it would cost another $5,000 to $10,000 to hire a contractor to raze the house so that provides a slight advantage to someone wanting to restore it. 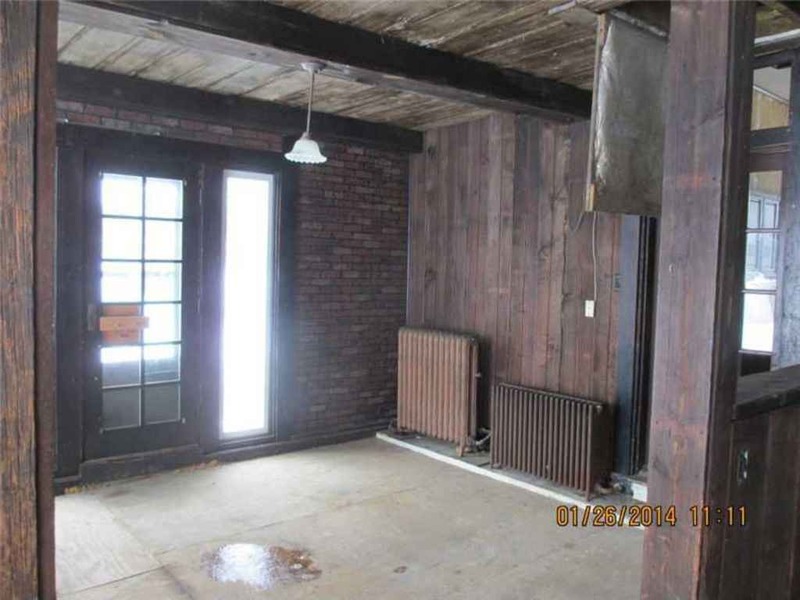 As for the plain brick mantel, no, its not original. But salvage sources can provide a suitable 1880’s or early 1890’s replacement which is not difficult to retro-fit. The main dimension is the hearth opening-the replacement mantle must be dimensioned to cover the opening like a picture frame around a painting. Careful measurements will prevent a mismatched mantel. (replica shiny glazed Victorian hearth tiles can also be sourced) Expect to pay around $500 to $2,000 for a good replacement mantel. 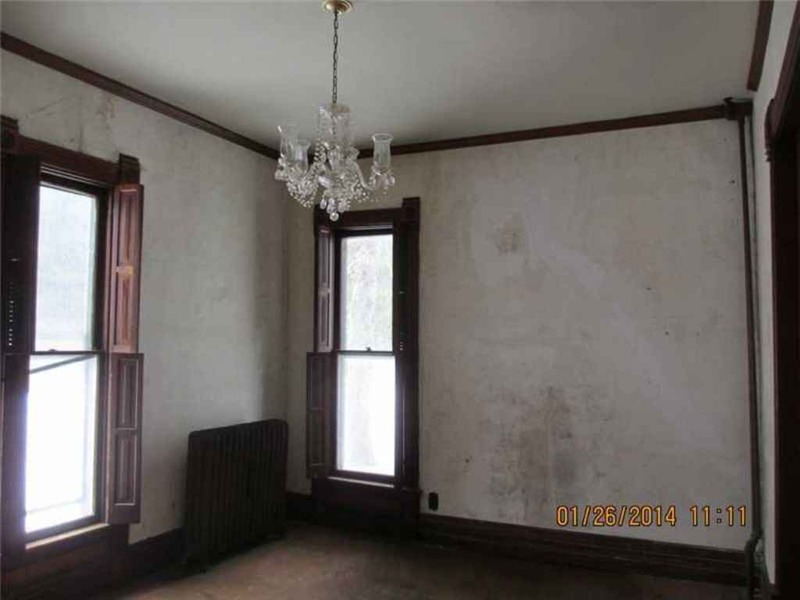 (with beveled glass mirrored over-mantel) I recall seeing a stellar 1880’s mirrored mantel on Covington, KY’s Craigslist some months ago for a bargain $300 but it had been painted a horrible green color. (easily cleaned up assuming the paint was put over the original shellac finish) In short, it’s not that hard to find a good replacement mantel in that region. Having said all of that, this is still a MAJOR project house and sweat equity will only go so far. The real outlay will probably be for plumbing, electrical, HVAC systems upgrades but if the buyer is lucky, some of the existing components might be serviceable for now. I would not recommend a gut rehab approach because you will end up with an empty shell of studs and the discouraging vision of thousands of hours of work ahead. Far better would be to tackle one room at a time in a priority manner. (i.e. bathroom, kitchen, and a bedroom) A sound roof would be essential before any interior work is started. Restored and painted in period colors (rather than the drab grays) this house would be impressive. Good luck to someone who feels up to the challenge-they will be preservation heroes in my book. Thank you for the encouragement! Now I have to figure out a price to offer. I also forgot to add that the realtor felt that it was not worth renovating because you could build a new house on the property for the same amount of money. I know we all heard this before but I can never get use to hearing this and that is what put me over the edge the other day. That’s annoying. I guess she’s partially right if you want to build a tasteless house in it’s place. I dislike it when agents are so insistent that no one wants it or any old house and it MUST be torn down and then market it that way. I don’t even understand why she would talk that way, if you are calling about the place and interested in it, it’s almost like she is trying to talk you out of buying the place! Well, one COULD knock the house down and put a new house on the lot for the cost of renovating. OK. But you would end up with a cheap, standard, boring house. Albeit sensible. To replicate the current house, and its high ceilings, plaster walls, stunning old-growth trim, paneled doors, and presumably magnificent staircase, would cost VASTLY more then the renovation costs. To replicate such a house, exactly, and with everything the same quality, will be around $1.2M. So, to tear down and build new, you will get….yawn. To restore for the same amount, you will get…OMG! OMG! OMG! I looked at that house today. Stair way is awsome curved around with carved trim hand rails stained brown. With window next to it. That was the nices part of the house. The rest needs alot work. Lime stoned foundation with railroad ties on it. The bottom part of wood siding fell off at part of house. Ban board rotted at spots. Had new electric box with wires going threw house in it but a scrapper took cut and taken the wires. Lot of the window 6’×2′ are broke and wood frame rotting away. Wood floors are missing section or have holes in them and are wavey. Yes, but all that is expected in a house priced at $11K. The house begs the age-old question: is the glass half full, or half empty? I understand somewhat about foundations but what are railroad ties. Please excuse my ignorance. There is not a lot of construction happening in Waldron, Its only saving grace is its within commute distance to Indy. Land is “dirt cheap” around there, so any ‘thoughts’ the realtor has of anyone coming along and doing a “tear down” is just fantasy. Architecturally, a real jewel. Its built literally at ground level, but probably Indiana Clay which is hard as a rock. Properly draining the downspouts, take out the concrete and put in a wood porch floor. Most people will want a new HVAC system but with care the ductwork can be run. Maybe two systems, one in basement one in attic to zone it properly. New roof 5-6 color preservation paint job , New kitchen, a few years of work or 6 months of contractors and throwing money at it not a bad house and if one were willing to be patient they could probably get their money back (because its close to Indy) If I didn’t have several house restorations going on at once in Cincinnati and house to sell in Indy, I’d buy it. But common sense prevails at the moment. 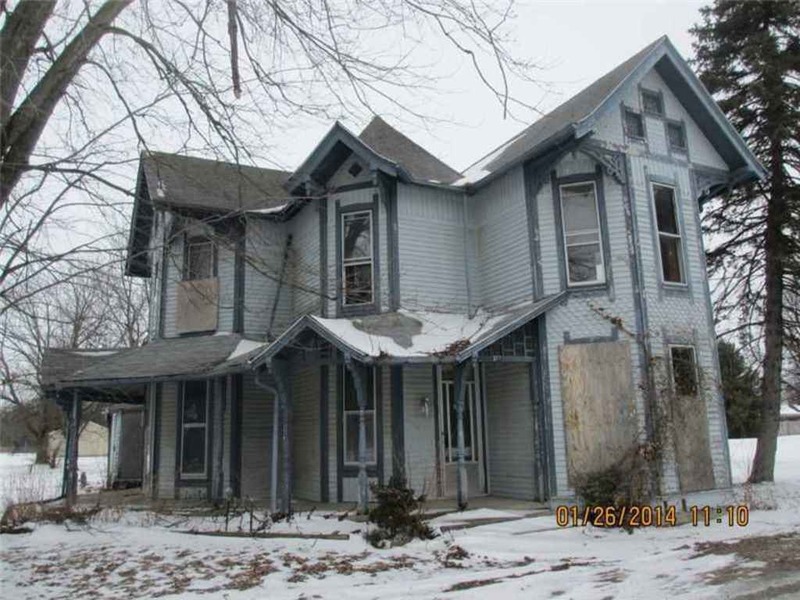 Type of house Indiana landmarks needs to pick up for their FLIP program. Get some deed restrictions on it and that way its future is certain. House is deemed un habit able by shelby co health department. I dont know why. My guess is It needs a new septic. The steam radiation pipes been cut in several places. They dont show no pictues of the back of house where all the damage mostly is. Lots wood sidings is missing and is rotting on back. House is on corner of big lot. Only 5 feet from both streets front and side. The side street is entrance to a housing edition. Awaiting more information from the realtor but the house being five feet from the road on two sides may not make this a viable option anymore even though it tugs at my heart strings. I would go and see it now but it is a little far for me to go without the additional information I have requested besides a major patch of bad weather is coming my way for the next two days. I will be calling the Shelby board of health and see what the issue is. Again thank you all for the support and I will keep you posted on the upcoming saga of the lovely house on Mulberry Street. I just heard back from the realtor and she said that there was a lot of termite damage to the back of the house. She provided more photos and the house is gorgeous but TERMITES! I just got a recap from my realtor on the condition of the house. There was a photo where wood was missing or decaying all along the north side of the house at the foundation. She said that the wood floors inside in spots were damaged because of termites and were very weak. I really wanted this to be water damage but she keeps saying there is extensive termite damage. My fear is that I will never get rid of the termites and that there is extensive structural damage. I really do not want to throw five hundred dollars away for some inspection where there is a great probability that I will never purchase it. I am slowly trying to talk myself out of the house but it is not easy. There is a point where money starts having a sobering effect. With this much damage I do not think I can take on the challenge. If things change I will let you all know. Thanks for listening to my despairing babbles. My husband and I went by this house on Sunday just to check it out. We walked around the outside. The house is very close to the road as stated. The “roads” are more like alleys though- very narrow, with the houses close to the “road”. The house has some pretty neat features and is a cool house, but it does need a significant amount of work in my uneducated opinion. There are several spots in the wood at the base of the house on the north side with significant rotting. Today I just found out my bid was rejected. So I am hoping with a higher bid that it was to high of a price just for the land. Lets keep our fingers cross that it went to a great owner who wants to restore it. Better yet I hope the new owner will make a post and keep us informed about the fate of the house. Thank you all for all the support that you gave me! I believe it is sold from realtor.com. Love the light fixture in pic number four. Love the window shutters and the window in the kitchen is beautiful. That house has great bones and could be a wonderful house again! I was just thinking of this home this morning, wondering the same thing. Does anyone here live around, do a drive by? This house was demolished over the weekend. I live just outside of town and go to the church across the road. 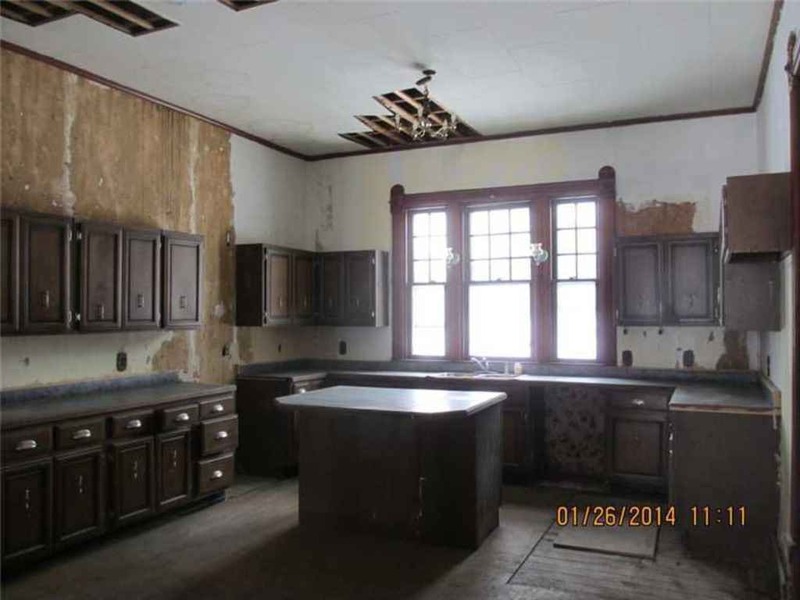 This house was pretty far gone unfortunate because it could have been beautiful! From what I hear it only took a few shoves of an excavator to completely fall in. Oh my…that was one of my fears all along. This house needed a labor of love type owner who would ignore the immediate costs to make it livable. Now being wrecked but the owners turned sellers will likely make a profit for the lots where this one stood. Poor old house, so many here saw some potential in it. What a waste! It says a lot about our modern culture that the craftsmanship, materials, and history have so little value these days while thrown together overpriced houses out in the sprawling burbs continue to sell like hotcakes. Of course, in 30-40 years the tract houses out in the burbs will be gone and no one will be saddened by their loss. They will never build houses like this one again. This was the home of one of my high school friends. Her parents relocated to Missouri in the late 90’s. I spent lots of time in that house, and loved it. Could have been amazing had the right person bought it.